WallStars show positive broker target price upsides. Cresud SACIF topped the September consumer defensive WallStars analyst-estimated net gains as of 9/21/18. The consumer defensive sector consists of thirteen component industries. 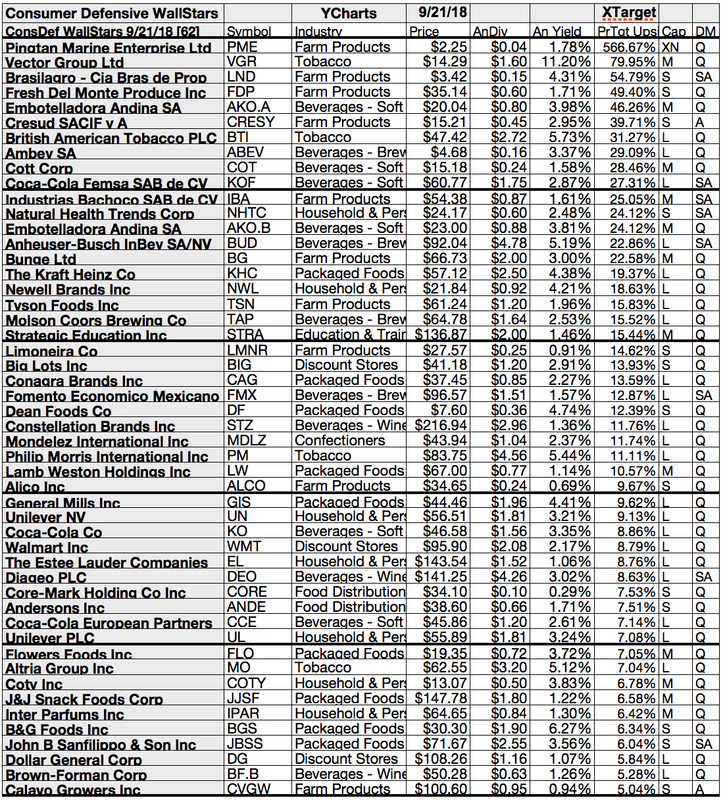 Top 50 WallStar firms represented all thirteen. 50 Top WallStar yields ranged 1.36-11.2%. Top ten, LND, KHC, GIS, DF, MO, BUD, PM, BTI, BGS, and VGR, averaged 5.68% yield. Top three consumer defensive WallStar net gains from Ambev, British American Tobacco, and Cresud SACIF averaged 35.23% per 1yr. broker targets. $5k invested in the lowest-priced five September top-yield consumer defensive WallStars showed 37.87% less net gain than from $5k invested in all ten. Big high-priced stocks dominated the consumer defensive September top ten list. Four of ten top dividend-yield consumer defensive WallStars were among the top ten gainers for the coming year based on analyst 1-year target prices. (As tinted in the chart above). Thus, the yield-based forecast for the consumer defensive socks, as graded by those Wall Street wizards, was 40% accurate this month. Cresud S.A.C.I.F. (CRESY) was projected to net $409.89, based on dividends plus a mean target price estimate from two analysts, less broker fees. The Beta number showed this estimate subject to volatility 45% more than the market as a whole. 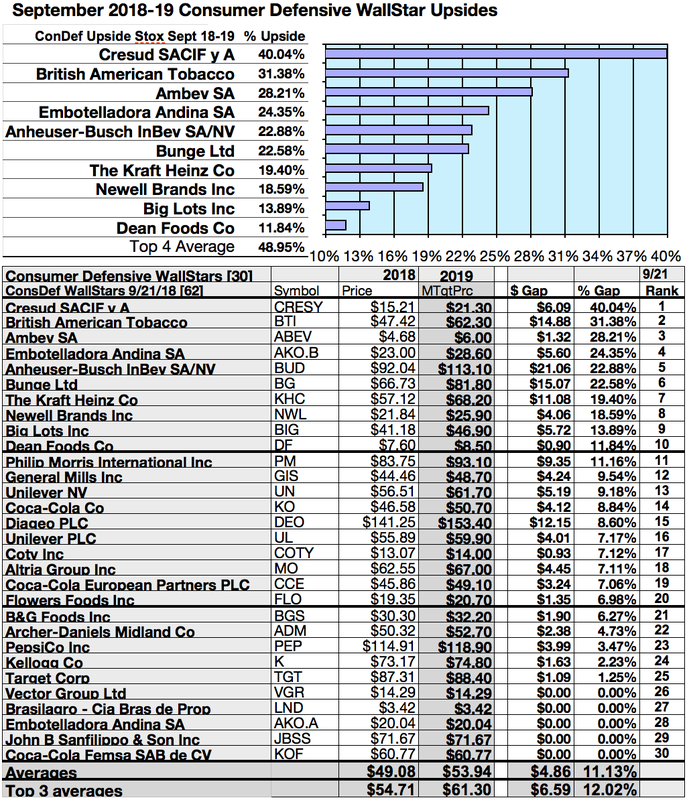 British American Tobacco (BTI) was projected to net $351.08, based on a mean target price estimate from three analysts plus the projected annual dividend, less broker fees. The Beta number showed this estimate subject to volatility 1% over the market as a whole. Ambev (ABEV) was projected to net $295.78, based on dividends plus a mean target price estimate from eight analysts, less broker fees. The Beta number showed this estimate subject to volatility 47% less than the market as a whole. Embotelladora Andina (AKO.B) was projected to net $261.61, based on dividends plus a mean target price estimate from seven analysts, less broker fees. The Beta number showed this estimate subject to volatility 98% less than the market as a whole. Anheuser-Busch InBev (BUD) was projected to net $260.75, based on a median target price estimate from nine analysts plus dividend, less broker fees. The Beta number showed this estimate subject to volatility 7% less than the market as a whole. Bunge (BG) was projected to net $235.81, based on dividend plus a mean target price estimate from ten analysts, less broker fees. The Beta number showed this estimate subject to volatility 12% over the market as a whole. Kraft Heinz (KHC) netted $217.75, based on a median target price estimate from twenty-three analysts plus dividends, less broker fees. The Beta number showed this estimate subject to volatility 30% under the market as a whole. Newell Brands Inc. (NWL) was projected to net $208.02, based on dividends plus a mean target price estimate from thirteen analysts, less broker fees. The Beta number showed this estimate subject to volatility 38% less than the market as a whole. Big Lots, Inc. (BIG) was projected to net $148.04, based on dividends plus a mean target price estimate from twelve analysts, less broker fees. The Beta number showed this estimate subject to volatility 2% over the market as a whole. Philip Morris International (PM) was projected to net $146.09, based on dividends plus a mean target price estimate from twenty analysts, less broker fees. The Beta number showed this estimate subject to volatility 18% under the market as a whole. An average net gain in dividend and price was calculated at 25.35% on $10k invested as $1k in each of these ten stocks. This gain estimate was subject to average volatility 18% less than the market as a whole. 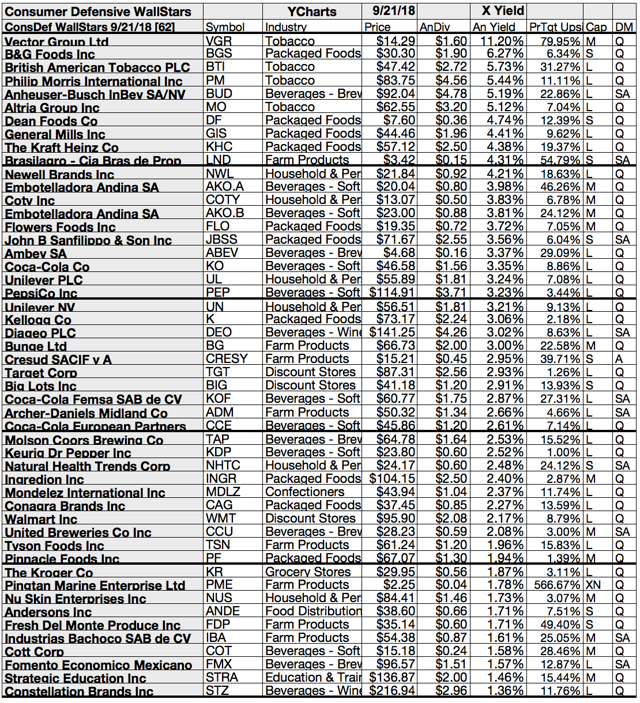 Yield (dividend/price) results from YCharts September 21 verified by YahooFinance for sixty-two stocks produced the actionable conclusions in this article. 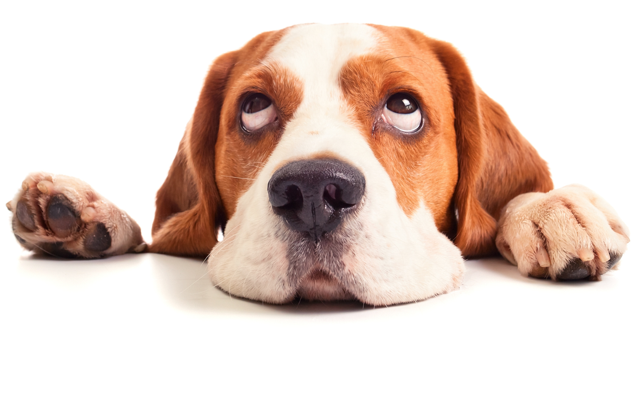 Stocks earned the "dog" moniker by exhibiting three traits: (1) paying reliable, repeating dividends, (2) their prices fell to where (3) yield (dividend/price) grew higher than their peers. Thus, the highest yielding stocks in any collection became known as "dogs." More precisely, these are in fact best called "underdogs." Top ten Consumer Defensive equities selected 9/21/18 by yield represented four of thirteen constituent industries. Top yielding Consumer Defensive stocks found a tobacco stock placed first, Vector Group Ltd (VGR) . Three tobacco representatives followed, placed second, third, and fifth: British American Tobacco ; Philip Morris International ; Altria Group (MO) . Four packaged foods representatives placed second, and seventh to ninth, B&G Foods (BGS) , Dean Foods (DF) ; General Mills (GIS) , and Kraft Heinz Co. . 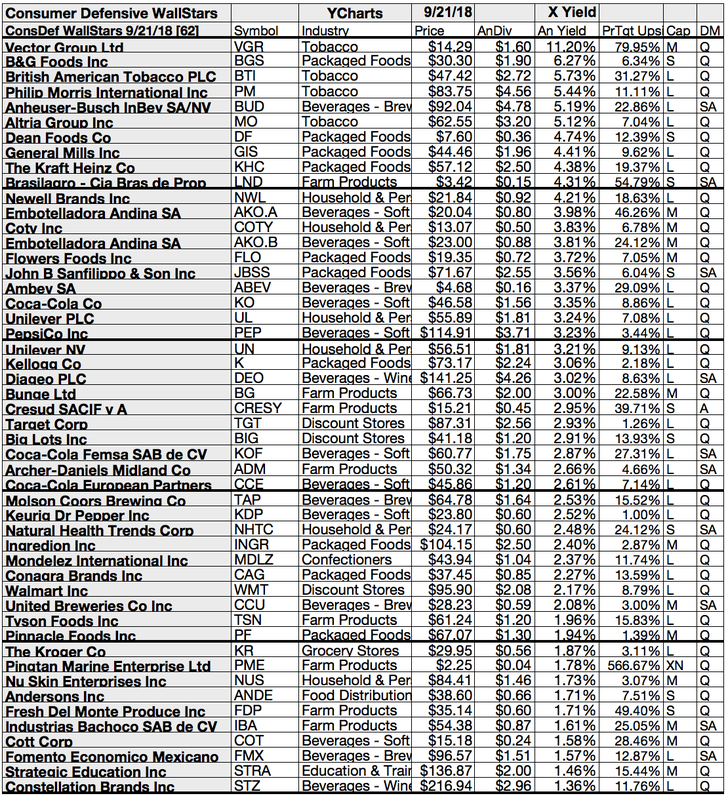 Finally, one beverages - brewers issue made the top ten in fifth place, Anheuser-Busch InBev , and a farm products organization placed tenth, Brasilagro - Cia Bras de Prop Agricolas (LND)  to complete the September Consumer Defensive WallStars top ten by yield. Nine more industries constitute the sector: (1) beverages - soft-drinks; (2) beverages - wineries & distilleries; (3) confectioners; (4) discount stores; (5) education & training service; (6) food distribution; (7) grocery stores (8) household & personal products; (9) pharmaceutical retailers. To quantify top dog rankings, analyst median price target estimates provided a "market sentiment" gauge of upside potential. Added to the simple high-yield metrics, analyst mean price target estimates became another tool to dig out bargains. Ten top Consumer Defensive WallStars were culled by target price and yield for this monthly update. 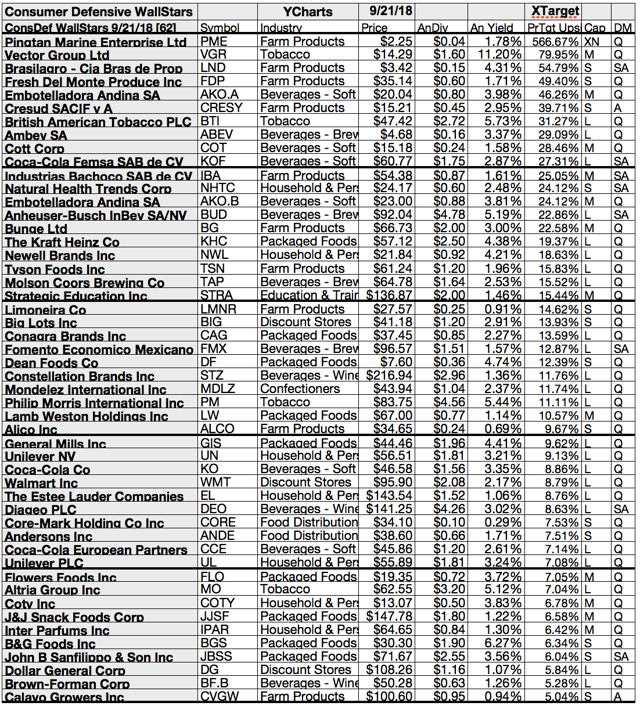 Yield (dividend/price) results verified by YCharts did the ranking. As noted above, top ten Consumer Defensive equities selected 9/21/18 showing the highest dividend yields represented four of thirteen industries composing the Consumer Defensive sector. $5000 invested as $1k in each of the five lowest-priced stocks in the top ten consumer defensive WallStar kennel by yield were predicted by analyst 1-year targets to deliver 37.87% less net gain than $5,000 invested as $.5k in all ten. The fifth-lowest priced Consumer Defensive top yield stock, British American Tobacco PLC, was projected to deliver the best net gain of 35.11%. The five lowest-priced September 21 were: Brasilagro - Cia Bras de Prop Agricolas; Dean Foods Co.; Vector Group; B&G Foods; General Mills, with prices ranging from $3.42 to $44.46. 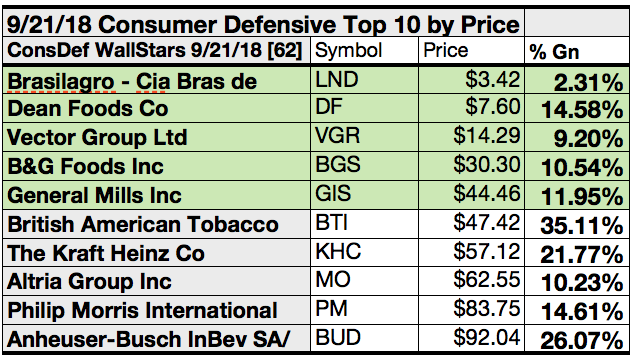 Five higher-priced Consumer Defensive WallStars for September 21 were: British American Tobacco; Kraft Heinz; Altria Group; Philip Morris International; Anheuser-Busch InBev, whose prices ranged from $47.42 to $92.04. That distinction between the five low-priced dividend equities and the general field of ten reflected Michael B. O'Higgins' "basic method" for beating the Dow. The scale of projected gains based on analyst targets added a unique element of "market sentiment" gauging upside potential. It provided a here-and-now equivalent of waiting a year to find out what might happen in the market. Caution is advised, since analysts are historically only 20% to 80% accurate on the direction of change and just 0% to 20% accurate on the degree of change. Stocks listed above were suggested only as possible reference points for your Consumer Defensive stock purchase or sale research process. These were not recommendations. Catch A Dog Of The Day on Facebook! Consumer Defensive pups qualify as valuable catches! Find them among the 52 Dogs of the Week I, or the 52 Dogs of the Week II now showing full returns. Dogs of the Week III (Safari to Sweet Success) is currently accumulating gains. Yes, a new portfolio named Ivy (IV) has launched! Click here to subscribe or get more information.